ZEMOS98 will bring feminist-orientated care and warmth, Remix for Bien común (Remix for the Commons), Commons spirit and Love to the North. In particular they will share their Audiovisual Source Code (Código Fuente Audiovisual) format and approach. 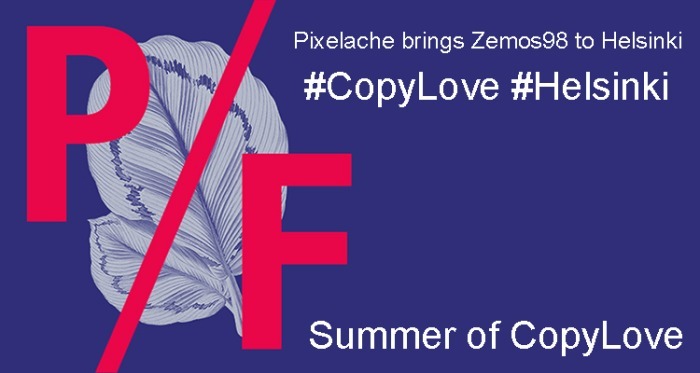 We are hopeful we can all benefit from a ‘Finnish Summer of CopyLove’ gathering peer-support and attention to contribute to their and our dreams come true. During Zemos98’s visit to Helsinki we will organize several events in the framework of the Pixelache Festival. We will be disseminating open practices and open formats for audiovisual creation that we firmly believe contribute to co-create ways of performing multi-cultural understanding, increase the connections between South-North, and allow us all to contribute to much needed empathy and care in the world. 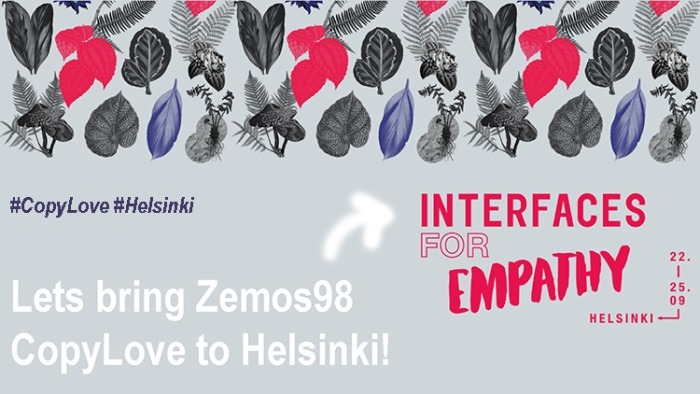 2-3 public presentation events in Helsinki on the topic of CopyLove and Interfaces for Empathy. The events will take place during the Pixelache festival days 22-25.9.2016. They will be live-streamed, and the documentation archived online with commons-orientated licenses. One of the events will be in Spanish, and the other one or two in English. All the events will be simultaneously translated to another language (either English or Finnish). 1 CopyLove workshop (registration-based) on the topic of Caring for Each Other and Interdependence. In the workshop we will crowdsource ideas and approaches towards promoting care-economics and caring commons and we will co-design and co-produce an open manual. This manual will be shared post-event with text content variably in English, Spanish and Finnish. Related events according to reward scheme to peer-supporters (See rewards). CopyLove and Empathy are themes that speak to the current environment of tension, division and isolation that communities feel are encroaching their everyday lives. Instead, Pixelache festival creates a different narrative of collaboration and empathy that we think will greatly benefit from the input of our colleagues from Zemos98. 1. Citizens worried about increasing intolerance in Finnish society and want to support concrete actions that create new narratives. 2: Alternative Economy Cultures -oriented initiatives, including crowdfunding & feminist/care economics that want to cross-pollinate their thinking across Europe. 3. To the Spanish-speaking community in the Finnish metropolitan (Helsinki)-region. 4. The Open/AvoinGLAM and AV practitioners, activists and researchers who want to learn more about the Audiovisual Source-code method and event-format, and Remix for the Commons approach. – Develop, disseminate and encourage the Audiovisual Source-code format as a way to talk and generate empathy and CopyLove. – Make migrant and local connections between North-South. – Promote Goteo and commons-orientated crowd-funding in Northern Europe. We are sister festivals that only recently met after all our time apart. We care. Pixelache people have been making their festival since 2002 in Helsinki, Finland. Zemos98 people have been making their festival since 1998 in Sevilla, Finland. Both have grown up to absorb trans-disciplinary subjects and to promote Caring for the Commons around the same time (2014-2015). 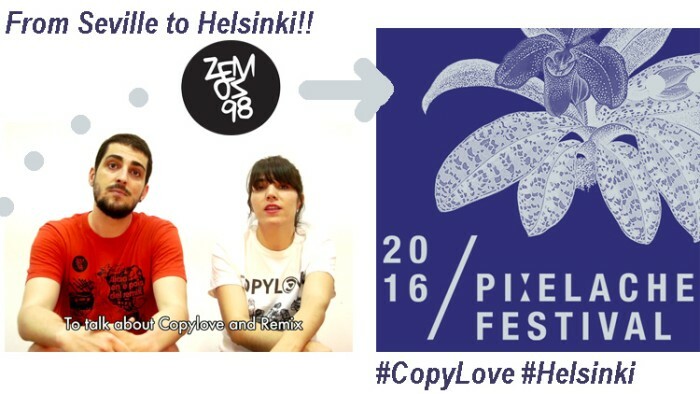 ZEMOS98 took the theme CopyLove as it’s festival theme in years 2012-2013 and made a successful related Goteo campaign. ZEMOS98 no longer produces a festival but focuses on other projects and has consolidated a good network around these topics in the South of Europe. Pixelache Festival in Helsinki is partly supported by the Finnish Ministry of Culture and Education and City of Helsinki, this year the full-time and part-time staff employed by the association are also co-directors of the festival (Petri Ruikka and Mari Keski-Korsu respectively). Pixelache has strong presence in the Northern European cultural scene, and benefits from a broad international network. We Care.. We are not only colleagues, but best of friends, and we want to bridge across South-North. Andrew Gryf Paterson from Pixelache has been an artist-organiser for over 12 years in Helsinki and internationally with a strong profile, focused on open-source culture and Commons-oriented strategies. In 2009 he organised the Alternative Economy Cultures symposium in that year’s festival, whereby the 2 keynote speaker’s (Michel Bauwens and Michael Albert)’s travel costs from Madrid and Massachusetts USA were fully crowdfunded. Previously part-time staff role for 4 years, he is again on the association’s board with responsibility for International Networks and Archival-tendencies. Andrea Botero is a Colombian designer and researcher based in Helsinki for over 10 years, with a keen interest in caring for the commons and participatory methods. She is co-editor of the Peer-Production in Public Services: Cases from Finland ebook (together with Paterson and Joanna Suud-Salonen), and has been lead-researcher on co-p2p.mlog.taik.fi platform at Aalto University. Mariana Salgado is an Argentinean design researcher that has worked 10 years in the cultural sector in Finland, and has actively contributed to the Finnish chapter of OpenGLAM (Galleries, Libraries, Archives and Museums). She was invited last year to the Hackathon Caring for the Commons at 17th ZEMOS98 Festival, and got inspired by the CopyLove sessions and Zemos98 activities. She published in Spanish the book: Diseñando un Museo Abierto (Designing an Open Museum, 2010). Mariana is an activist in her neighbourhood, and within the Spanish speaking community in Finland. At first glance, Goteo is a platform for civic crowdfunding and collaboration on citizen initiatives and social, cultural, technological and educational projects. Goteo has replicas and alliances in several countries, thanks to its open source code as well as the awards and international recognition it has gathered since 2011. It is a tool for generating resources ‘drop by drop’ for a community of communities consisting of over 65,000 people, with a funding success rate over 70%. But in reality, Goteo is so much more. There is a non-profit foundation (with consequent tax advantages for donors) behind the platform, and a multidisciplinary team developing tools and services for co-creation and collective funding. Our commons mission is tightly linked to principles of transparency, progress and societal improvement.